Landscaping rocks can be used to great effect in many different types and styles of gardens. They are cost effective, attractive, and relatively simple to care for, which makes them a fantastic addition to many different landscaping designs. There are also a lot of different varieties of landscaping rock, each with a unique appearance and set of strengths. This makes landscaping rocks a very versatile decorative or functional feature, as different types of rocks can be utilized to create many separate looks with disparate utilitarian features. Because they have so many benefits, fledgling landscaping designers are often quick to include many different types of landscaping rocks in their plans and sketches. But although the majority of landscaping rocks are quite sturdy and can be used in most sets of circumstances, each type of landscaping rock does have its own unique care requirements. This is because landscaping rocks are in fact created from stones that have widely differing physical properties and mineral compositions. It is this that makes some types of landscaping rock particularly well suited to certain types of usage, and other less than ideal. To create a good landscaping design that balances attractiveness with longevity, it is necessary to take these types of rock qualities into account. For those who are using rocks in their next project, here is what you should know about landscaping rock types and their different uses. This attractive blend of rocks often brings to mind the bed of a crystal clear stream. It consists of many different types of rock, all of which are tumbled into smooth forms by the constant motion of a river or stream. Some sources of pea gravel also use a machine tumbling process to simulate the type of erosion caused by the movement of water. Their unique creation process gives these landscaping rocks a beautiful shine and luster, which many people find very attractive. They can also be composed of many different colors or a single hue, which makes them appropriate for many aesthetic themes. Because the stones that constitute pea gravel are often quite small, it is best utilized as a covering for areas of ground. It makes a good bordering rock, but needs to be help in by some kind of trimming, as the smoothness of the small pebbles makes them susceptible to being washed out of place by rain or other sources of water. Pea gravel can be a little pricey, so it is often used as a small decorative touch. The individual stones are light, so pea gravel is also suitable for planting some types of plants in. These porous igneous stones come in many different sizes, which makes them quite versatile. Lava rocks are often used in water efficient gardens as a ground covering, as their many pores hold in water well whenever it is used. They are extremely lightweight, and some types of lava rock are even capable of floating. This makes it an appropriate medium for a variety of different plant types. Most lava rocks are a light red or dusty pink color. This is a great hue for southern themed landscaping, as it evokes the feeling of a desert. Its highly textured surface helps keep it in place, so lava rock can be used to cover large areas of ground. It is also fairly inexpensive, which further adds to its appropriateness as a rock that is used for covering whole yards or driveways. It can be an attractive and ecologically friendly replacement for a grass covered lawn. Flagstones are made from types of rock that naturally cleave into large, flat plates, making them perfect for paving. Flagstones are created from many different rocks with widely differing mineral compositions, although they all share the trait of being quite resilient. These landscaping rocks are the best for creating a path of lane, as their broad and even surfaces are very conducive toward walking. Because most flagstones are flat on both sides, they often require some sort of textural anchoring in order to keep them from shifting over time. Most landscaper recommend putting down some coarse gravel within a bordered area, as the rough surface produced by the gravel helps stop flagstones from moving. Flagstones tend to have rather irregularly edged shapes, which is widely considered to add to their rustic charm. Most paths made of flagstones will not piece together in a completely regular way. Finally, the largest rocks used in landscaping are boulders. These rocks can vary widely in size, with some the approximate size of an apple and others the size of a small car. They can be made of many different minerals, and often have differing physical properties. Boulders are generally called boulders because of their size, instead of their composition. Boulders are rather attention drawing accents, so they are best used as a centerpiece or focal point. A large boulder placed on top of a gravel bed can be a natural way to divide up a large piece of otherwise awkward looking empty space. Boulders can even be put into use as a functional feature. A few boulders around a pool can naturally suggest a sitting area. Learning about landscaping rock types is essential for creating effective landscaping types. Once you can accurately answer most all queries about landscaping rock types, you will be able to more confidently create rock features that are attractive and long lasting. If you are still looking at dirt, mud and plants that need care and watering, you got this all wrong. The yards in front and behind your home can be wild meadows, desert vistas, paths into the unknown and even a veritable canvas on which to display your personal brand of ingenuity and design. Spring 2016 has already sprung and the summer will be with us soon bringing warm nights and lots of sun. The time to think big in the backyard without blowing a hole in your financial plan is right now. Following are 11 Landscaping Ideas to recreate your garden in an attractive and engaging way. Create a lush hedge of summer-flowering perennials along the edge of your property outlining the boundaries between neighbors or even the adjoining road. Some great options for this project would be the echinacea Coconut Lime, Digitalis Ferruginea Foxgloves, phlox paniculata David, Aster Bluebird and Platycodons. Buffers of perennials around the rim of your garden is a great replacement for ugly fences that can give your garden the boxed in look. Oh, don’t forget the tough and hardy eutrochium plant, Joe Pye with pretty pink flowers grows just about everywhere. Backyards of all sizes can be cleverly divided in two by an attractive walkway, or even a staircase if the garden slants, that bisects the length of the garden. A cooling and relaxing effect is achieved by mirroring the gardens on either side of the division. It’s not necessary to repeat every plant on the other side of your mirror-image. The effect is best perfected by seeking rhythm and repetition of colors, sizes and shapes by side-by-side plantings. A project like this should be ongoing and constantly rebalancing itself, till a satisfactory symmetry is achieved. Create a corner of the garden that the family can gather round for strengthening ties and roasting marshmallows. Choose a corner of the yard on the edge of the property that is furthest away from the home, this will create the far and away feel to this special spot. Setting up a distant destination in the corner also makes the yard feel a bit more spacious. You will want to fence it in though, there are all kinds of foragers from the animal kingdom that might try and take advantage of your feast. Plant your favorite veggies in raised beds extra zucchini please and prepare for a summer of feasting on salads and zucchini delights. Some of the greatest edibles to raise yourself are lettuce, which is ready in just a couple of weeks, and tomatoes, with their attractive red orbs these make an excellent tutorial to the world of veggie gardening. An air of mystery and adventure can be added to gardens of all sizes, all it requires is a little positioning and sense of depth. A path leading to the unknown can be accomplished with some subtle curves and shrouding perennials planted alongside the path ó be sure those perennials do a good job of shrouding the final destination ó even if it’s just the water hose. Combining a shading-mysterious path, a family firepit and a perimeter of perennials will produce an effect that is sure to win best garden on the block and is not nearly as costly as you’d think, especially if you DIY all the way. On that note, a combination of two or more of these 11 Landscaping Ideas is a perfect start to a garden of your personal design. Summer nights will bring dinner outdoors under the night sky and chirping crickets. For a splash of festivity string up some cafe style lights or go for a rustic look with some strategically placed tiki torches they never get old. Creating a destination in the garden is a time honored tradition. Places to think, places to play but the most rewarding of all would be a shady place to take a relaxing nap. You will need some sturdy trees, you could lie under an umbrella but you would miss the sunlight filtering through the foliage overhead. Then you will need a hammock, and badabing; you are set for some lazy summer afternoons. Lemonade? And speaking of Lazy summers, how about not watering and mowing anymore? You are only wasting water, time and effort. There is a natural alternative to the manicured lawn called the wild meadow. Tear up the lawn and fill the area with tough native wildflowers. Perhaps the whole watering and mowing rigamarole is too much, but you still want the turf? Never fear! Human innovation has produced an artificial substitute that looks great, doesn’t need to be watered or mowed and is pretty comfy underfoot. Don’t think less of your garden if you go the artificial way, it’s a perk of living in the modern era. Isamu Nouchi, artist and designer from the mid- 20th Century, once said that ìI see my garden as a sculpture of Space.î Bringing an artistic touch to your garden and lawn can be done with the inclusion of a sculpture or even just some abstract rock formations deftly placed around the garden. Certain people living on the fringes of the great backdoors, sometimes report problems with deer, rabbits and even wild pigs breaking into the garden and consuming the Begonias, or whatever. There are ways to keep our persistent animal friends at bay without going ballistic on them or turning your garden into a high security fortress. Depending on the type of intruder your are perturbed by, there are many attractive and effective fencing options. See your local animal control specialist or local gardening outlet for specific ideas for thwarting the intruders common in your area. So there you have the best 11 Landscaping Ideas for this summer. Be sure to document your process carefully and take tons of pictures, this way you can expect and even better production next year. Are you looking to redesign your entire landscape? Are you just making a few changes to the landscaping design already in place? Are you wondering what to consider before landscaping? Whatever the case, you need to consider a few important factors before commencing anything. Most people prefer visiting the local garden store to browse through selections. However, creating a plan before trying anything is a good idea. Well, here is what to consider before landscaping. You need to consider elements such as the climate in your region, the topography, the type of soil and many more things before you can start landscaping. You can find all the necessary research online. Depending on the current conditions of your yard, there is a chance you might have a micro climate. Therefore, take that into consideration before doing anything. Don’t forget to consider the drainage of water into the soil, especially away from the house and into the other areas of the landscape. Before doing anything, you need to consider who will be using the yard once it’s finished and how it will be used. For instance, are your children going to be playing in the yard? Are the pets going to be sleeping or playing in the yard? Do you consider using the yard for entertaining guests? Note that, it’s possible to create different spaces for various uses with specific designs and tricks. Don’t forget to add walkways for moving people from one area to the other effortlessly. By choosing a particular theme for your yard, you can guide plants and unify your landscape accordingly. You can choose consistent forms or shapes in the garden. When choosing a particular theme, you should consider the current architecture of your home. Any theme you choose should complement the style of your home since the backyard is an extension of the house. A good theme will guide you in choosing which plants to add to your yard and where to place them. It’s also a good way to decide on the best structures and decorations for the landscape. You can either choose geometric themes, natural themes or anything else that brings out a colorful and beautiful yard. If you want to make the best use of your yard, you should think of it as another room in your house. If your house has carefully planned and designed rooms, you should do the same with your landscape. You can achieve this by using various landscaping materials wisely to bring out the best out of your yard. Create walkways and openings in the garden that allow easy exploration and movement. During the planning session, you should assess the function of plants in your landscape when it’s done. You can add plants to the yard for various functions. For instance, they can provide delicious vegetables and fruits, add beautiful scenery to the landscape and also provide beautiful and relaxing aromas in the yard. You can also use the plants as barriers and boundaries thus defining the areas in the yard. It’s easy to block the view and allow access to any area using specific plants. For instance, you should consider low growing plants to prevent access but provide a beautiful view of the yard. If you place the plants correctly, you can also alter the conditions in the landscape site. For instance, you can control the light, wind or temperature in any specific landscape using particular plants. They can also provide insulation from other noisy features in the landscape such as water fountains or bird houses. When choosing plants, you should consider the various visual planes in the yard. For instance, you should consider the overhead planes such as trees or archways. Secondly, you should check the vertical planes such as the spacing of the plants, layering or staggering of plants. Don’t forget about the individual and overall heights of all the plants in the yard. Finally, there is the ground plane that determines the grouping and arrangement of smaller plants, hardscapes and also groundcovers. If you repeat similar structures throughout the yard, you will get a unified view. If you want to highlight a particular area of your landscape, you should use garden ornaments, distinct structures or unique plants. The different sizes, shapes, colors and textures will direct the attention to the particular area. Each of these items has unique attributes that can complement and contrast accordingly. Therefore, if you take that into consideration, you can create a very integrated and appealing landscape. Of course, not only the visuals should be considered. Don’t forget about the aromas of the plants you choose to enhance the overall experience of the garden. For instance, you should find the scents that come into play when various flowers bloom and how they will complement each other. Of course, the plants will not look brand new forever. That’s why you need to consider how they will look after some time has passed. On that note, you should consider the growth rate of plants, the maintenance requirements and also the size of the plants when mature. Provide each plant with enough room for maturity but you should keep in mind the optimal conditions to achieve the desired height and size of maturity. In conclusion, with this information on what to consider before landscaping, you should be able to choose the right plants for your yard, the good designs, and themes that bring out the beauty of your garden. You want your home to be as beautiful outside as it is inside. 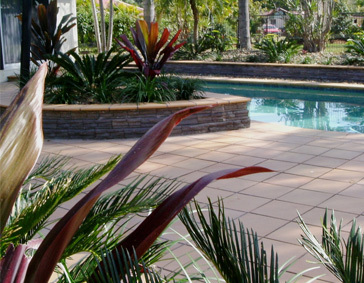 Your lawn, garden and landscape are an important part of making a harmonious, beautiful outdoor appearance for you home. While most designs and plantings can be done in DIY fashion, you might want to get some professional landscaping help to make it more incredible than you can imagine. Retaining walls are an essential part of a beautiful design. These help keep the landscape and gardens stable. Nature stone walls and landscaping are a unique, natural-looking way to add beauty to your outdoor area all while doing the job of retaining walls to keep the stability intact. Nature stone wall designs are virtually unlimited. You can get a wall that blends with the garden or trees, or one that surrounds them for visual emphasis and impact. You can choose one that is curvy, straight or angled. They can be installed to look formal or rustic in a way that complements any size yard or any style home. Any nature stone walls and landscaping designs have the job of helping with drainage, preventing flooding, keeping erosion at bay and beautifying the surroundings. All you need to do is decide upon the designs that will best fit your style. A professional landscape or hard scape company can assist you with ensuring any functional needs are met by your nature stone wall. With their help, the wall will last for years. Natural stone walls are excellent for creating landscapes along steep hill slopes. You may have thought you couldn’t landscape any steep areas in your yard, but you can. With nature stone, you can create garden paths along the slope to create an incredible charm. You can decide how you want your wall to look. Create your own vision and implement it with the help of your hard scape professional. Some nature stone walls and landscaping arrangements need to keep a sloped or hilly area from eroding. This is necessary to keep any and all plants there healthy, but it also helps keep erosion from causing more problems in the future, including protecting your home’s foundation from destabilizing. Leave the engineering to the professionals so that a secure, stable installation job can be done right the first time with the right materials. You can take over the job of deciding how the wall should look. It is not worth it to build your own wall with natural stone only to have a flood wipe it out or damage it. Trust a landscape professional to handle the design and construction while you work on creating the most attractive looking garden or patio. Find qualified professionals near you to offer the design plans as well as samples of the types of stone you can use to build your gorgeous retaining walls. The company you choose will probably have a website filled with sample photographs of their previous projects and designs. Use these as inspiration to create your designs and also use the website to choose the perfect stones for those designs. Stone walls work to fluidly blend your home’s design with nature in a harmonious manner. They can enhance patio areas, add dimension to flower beds and they can even make your outdoor living room or kitchen look like something out of an architectural magazine. These walls can actually be crafted into seating areas around fire pits or near water features. They can surround or accent water features. Your outdoor space will be made to look elegant, natural and relaxing. What many of your friends and family may not realize is how big of a job many of the wall areas have to keep your home and yard safe from flooding or other ground debris following a huge rain storm in your area. If you want, you can see natural stone samples in person before choosing them. Your hard scape or landscape company can come to your home with them for you to look at, or you can visit a local showroom. You are sure to find a beautiful stone that is right for your landscaping desires after taking the time to see all the stones available. They are available in an array of natural shades from browns to grays to so much more. Installing your stone wall can transform your patio. You can take the existing patio and add definition and texture to create a patio where you will enjoy the beauty of the rest of your landscape. The stones can enhance any furnishings you have or any lighting you have set up on your patio. Do not forget that, with your hard scape professional’s help, you can even build custom features like benches to put around your garden. You can even take individual stones and set them up in various arrangements around outdoor lighting fixtures to hide them in the day, and make them light up with a magical hue at night. Make your home as beautiful on the outside as you have it on the inside. See what working with nature stone and landscaping designs can do for you garden and outdoor areas. You can get the best of both function and form with them and increase your home’s value. Many of your stone wall creations will keep your yard and home safe as well as something to treasure for many years to come. Those who are going to be landscaping along wooded areas will understand how difficult the job can be when you are not sure about the approach to take. There are many people who are put into this situation and then wonder what they have got themselves into. There is no reason to worry as long as you have the following tips in your hands. These tips are going to make sure you are able to do the type of landscaping that is needed and make it look as nice as you want it to look. The garden area has to be outlined right away because you are going to be trying to create a balance between the wooded areas and the rest of the setup. This is where landscaping along wooded areas becomes hard because most people don’t know how to outline the area and/or forget to do this. You can’t just start. Put a plan together and then move forward. It is going to save you a lot of time and you are going to love the results that you get as well. This does not hurt one bit when you are trying to get a feel for what works. The foliage that is present has to be pruned and you are going to have to be attentive when you begin this process. Don’t just rush through it and hope you are going to get everything that has to be touched up. You have to be careful and be willing to spend a few hours on the process as those who are more vigilant are the ones who are going to get better results at the end of the project. Make sure you are being attentive to how the foliage sits and where it has to be pruned. You have to realize a clean landscape is always going to win people over and you are going to need to put in the time to clean things up. This means you are going to need to get rid of all the weeds that are in the garden and ensure the lawn is as clean as it should be right away. If you are not doing this, you are not laying the foundation for a good lawn and that us going to set you up for real failure, which is what you don’t want. Layers are key and those who don’t put thought into this are the ones who are going to stand and wonder why there is no balance in place with their landscaping. You have to work in high and low layers with the plans you are getting. Too much of one thing is going to make it look unappealing. This is why you have to plan it out in advance and make sure there is a real balance to the look you are going for and it stands out in a manner that is going to let you relax. Many people don’t think about this as much as they should. Accessories are a great way to bring life to the area and ensure you are getting the type of results that you are after. What type of accessories can you go out and get in order to see positive results? You should be taking a glance at accessories that are going to make things come to life as a whole. These would be things such as bird cages, bird baths, fountains, and/or benches. It is up to you as to what you are looking to put in place. The plants you are going to be putting in place along the wooded areas have to be low maintenance and there is a reason for this. The wooded area is going to be ‘messy’ and that is something you are going to have to take into account. When you are landscaping, you are trying to create an effect and that is only going to happen when you understand the value of not getting plants that are going to grow out and look like a part of the woods. When you are going to be landscaping along wooded areas, you have to realize being quick is going to waste time and is just not worth it at all. There is no reason to rush and those who do this are the ones who are going to miss out as a whole. Don’t take this sort of risk and just be as patient as you can be every step of the way. Those who do this are going to get more out of the process than those who just speed through everything and wing it. Make the most of these tips because they are going to come in handy right away and you are going to enjoy them from top to bottom. Those who want the best results are the ones who are going to make the most of these tips and are going to put them to use right away. It is these tips that are going to let you relax and just focus on the job at hand because these tips are proven to work and are going to do the trick as you want them to. Stop wasting time with solutions that don’t work. Are you looking to plant new things on your yard? Are you looking to start your own garden in your backyard? Whatever the case, here are the top 7 landscaping tips you should know. There are lots of decisions that go into landscaping and for a newbie, it can be quite overwhelming. However, with the right guidance you will have a fresh idea on where to start and continue from there. Certainly there are more than 7 landscaping tips that can come in handy in any situation but these are just the start. If you have a large yard, you might need to write down a list of what you need or want. For instance, are you looking to install a patio? Do you need to start growing vegetables in your backyard? Or do your kids need some space for their recreational activities? Before you get down to work, you could try making some sketches of what will go where and how to achieve everything on your list of priorities. Remember, nothing has been written on the wall yet but rather, these are just rough sketches of what your yard will look like. You can play around with the sketches till you have the right design for your landscape. Even better, you can ask for advice from people in your close circle or even professional landscapers. Certainly, if you are looking to add a patio in the backyard, you need to study the wind or sun patterns. The patio needs to be completely sheltered against any direct sunlight without compromising on the whole design or idea. Also, if you are looking to install a barbecue pit in your yard, you certainly need to study the wind patterns otherwise you will never be able to light up the grill. These are some of the few mistakes that beginners to landscaping often make. However, if you have studied the behavior of these natural elements throughout the year, you should have no problem. For most homeowners, the joy of having the best landscaping designs and ideas come to life can be quite overwhelming. However in the rush of installing these ideas, eventually the long term appearance isn’t good enough. Therefore, take a few months before installing anything and picture how your yard will look once its completed. With these ideas in your mind, you can go ahead and start working on your yard. If you have been watching the home makeover shows on TV, you are likely to get enticed by the large landscaping ideas and embark on the same road. However, unlike these shows, you don’t have a large crew to make your backyard ideas come to life. Therefore, don’t be extravagant especially if you don’t have the time and space in your backyard. Take your time and avoid sloppy landscaping mistakes that will haunt you forever. With a new house and backyard, there are bound to be many landscaping ideas that come to mind. However, you definitely need to start somewhere in order for your ideas to come to life. That’s why it’s important to find a focal point and start there. Whether it’s a sculpture or a water feature, you can work around that and develop your yard according to your designs. Definitely, your yard will have an exceptional look if you take into account proper scale and spacing. If there are any water features or sculptures in your garden, make sure everything is spaced perfectly for the best overall look. Don’t forget to add some cohesion by repeating some shapes, plants, colors or anything else that adds some edge to the whole design. There are new landscaping ideas, tricks and designs that are revealed every new day so you should be open to changing your original ideas to accommodate new ones any time of the day. As a beginner to landscaping, always practice patience. Nothing will fall into place upon the first try but with these amazing 7 landscaping tips, you shouldn’t have a problem. Drainage is an integral part of any landscape project. Sometimes drainage needs to be retro fitted to alleviate drainage problems. Usually this is because the drainage was not considered when the landscaping was constructed. Whilst not ideal there are many options to consider when fitting drainage retrospectively. -fitting of drainage pipes and pits. -minor alterations to existing landscaping to direct/control water flow. -installation of waterproof membranes to inhibit water flow. Of course the best solution for drainage is to consider the issues during construction and install the correct drainage solutions into the landscape project. Retaining walls, falls and land levels, installation of paved/hard surfaces, subsurface drainage, pipes and pits etc should all be considered when creating the best possible solution for the drainage of your landscape project.